From left, Beacon Falls Lion Club member Mike Krenesky, Adam Daniels and Jeff Kean, both members of Beacon Hose Company No. 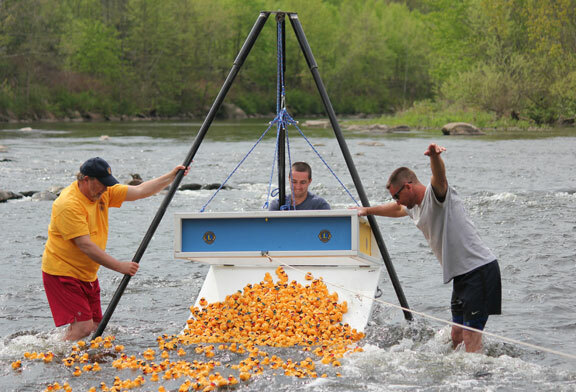 1, watch after hundreds of rubber ducks are released into the Naugatuck River during the 18th annual Beacon Falls River Festival and Duck Race in Beacon Falls last year. BEACON FALLS — Runners and plastic ducks will be put to the test the first weekend of May. The 2nd annual Jill’s Race for MS is set for May 6 at the Beacon Falls Recreation Complex, 100 Pent Road. The event, which is sponsored by the Beacon Falls Lions Club, features a 5K run, a half-mile Kids’ Fun Run, and a 2-mile fitness walk. The race is held in honor of former Beacon Falls resident Jill Betkoski, who had multiple sclerosis and died 11 years ago at the age of 48. The money raised from the race will benefit the Connecticut Chapter of the National Multiple Sclerosis Society. “It is nice to do the event in memory of her and raise money for the MS society,” Lions Club President Bill Mis said. The kids’ run steps off at 10 a.m. The 5K will start once that race is over, and the walkers will begin shortly after the runners. The registration fee for the 5K and fitness walk is $25 before race day and $30 the day of the race. The fun run costs $15 in advance and $20 the day of the race. Registration information can be found online at www.lightboxreg.com/jills-race-for-ms_2017. Race day registration begins at 8:30 a.m.
Mis said the race course is slightly different this year. Last year, the race started at the recreation complex and finished near the firehouse on North Main Street where the annual Duck Race and Riverfest is held. This year, the race will begin and end at the recreation complex, Mis said. “Starting at one place and ending at another, while you get to see more of town, logistically just doesn’t work well,” Mis said. Another change this year is that Jill’s Race and the Duck Race and Riverfest will be on different days. The 19th annual Duck Race and Riverfest, which the Lion’s Club also runs, is May 7 from 11 a.m. to 3 p.m. at Volunteer Park behind the firehouse. Mis said the two events are on separate days this year because doing both on the same day is labor intensive. The riverfest features live music, food and craft vendors, and a silent auction. The duck race starts at 3 p.m.
Raffle tickets for the duck race are available at the Beacon Falls Pharmacy, Beacon Falls Pizza, and New Harvest Restaurant, Mis said. They will also be available during the riverfest. The first nine ducks to cross the finish line will earn their ticket holders prizes. The grand prize this year is a Weber Genesis gas grill. Vendor spots are still available for the riverfest. Spots are $25. Those interested should call Sue Mis at 203-560-1586 for more information. The club is also still seeking sponsors for the event. Bill Mis encouraged people to come down to the festival, have a good time, and help the Lion’s Club continue to support the town. He said the money raised from the event goes toward a number of things the club does to help the town, including college scholarships it awards to students from Beacon Falls. “We do a lot for the town, and 90 percent of the money we raise goes back to the town,” he said.